One of the things to keep in mind when you are making a product, is whether or not the things that go into it, from features to branding, are adding value for the customer. I think we can tell from the title of this one that it may be trying to dazzle us a bit. This is a light I found at Costco, and last time I checked, they still sell it. 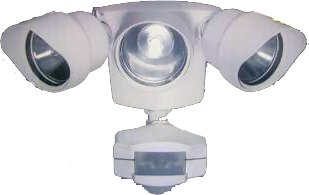 I have the two bulb variant of this light, and it seems to me that a third light would be a bit of a third wheel, but if you have a corner in your yard that you want fully covered and lit, this may be a good feature. The 360° coverage is fine, but assuming you are putting this on the side of a building, it is overkill. It would be nice on a corner. It has a blue LED that flashes whenever it detects motion, lighting up the whole motion detector plastic, even in daylight. This is handy if you want to check if it is functioning during the day, but otherwise seems a bit useless to me. Back to the original concept of adding value. You are paying for each of these features, are they worth it? I would have preferred to see something like an adjustment for accent lighting. The metal construction is sturdy enough, but the last two very similar lights I got from this company, one of them still works great after years, and the other quit working in less than a year. There is a three year manufacturer’s warranty at least, so keep your receipt, and maybe the UPC label as well. If it were me, I’d more likely choose this one for inexpensive commercial lighting, or this one for home security lighting. You can find this light at Costco, or if you would rather save yourself a trip, the EML 3 Light Motion Sensor is usually available here through amazon.